Fourteen year-old Ponyboy Curtis, is walking home from a Paul Newman movie. He is attacked by a group of Socs, the rivals of his gang, the Greasers. 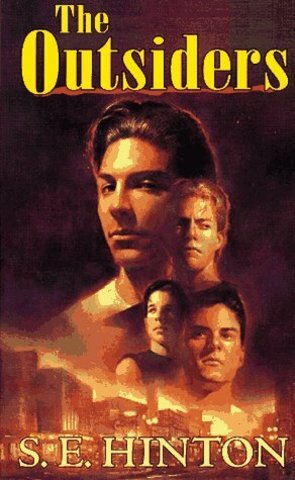 Ponyboy's fellow Greasers show up: Sodapop and Darry (Ponyboy's older brothers), Johnny, Two-Bit, Dally, and Steve. They fend of the Socs. Later that night, Sodapop reveals to Ponyboy that he plans to marry Sandy, another Greaser, in a few years. Ponyboy, Johnny, and Dally go to a double feature at the drive-in. They met two Soc girls name Sherri (Cherry) Valance and Marcia (last name unknown), Dally flirts with Cherry, who wants none of it. 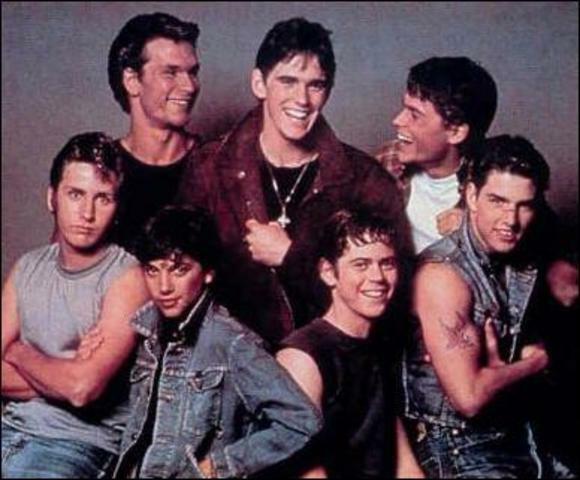 When Dally goes to buy Cokes, Ponyboy begins to talk about things, including his friends and family, Socs, and Greasers. 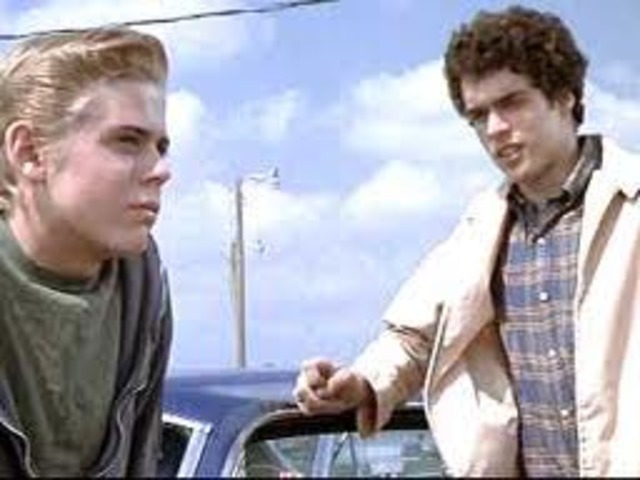 She tells him that Socs have just as many problems as Greasers, but Ponyboy doesn't believe him. Ponyboy and Johnny walk the girls home. Him and Cherry talk a little more, and are being trailed by a blue mustang. Their boyfriends, Bob and Randy, are in the car, and force them to get in the car. When Ponyboy gets home, Darry is incredibly angry and hits Ponyboy. Ponyboy runs out of the house in anger and finds Johnny, who he asks to run away with him. Johnny agrees, and the two set off. When Johnny and Ponyboy are walking in the park, they see the blue mustang from before. Five socs, including Bob and Randy, get out and try to attack the pair. 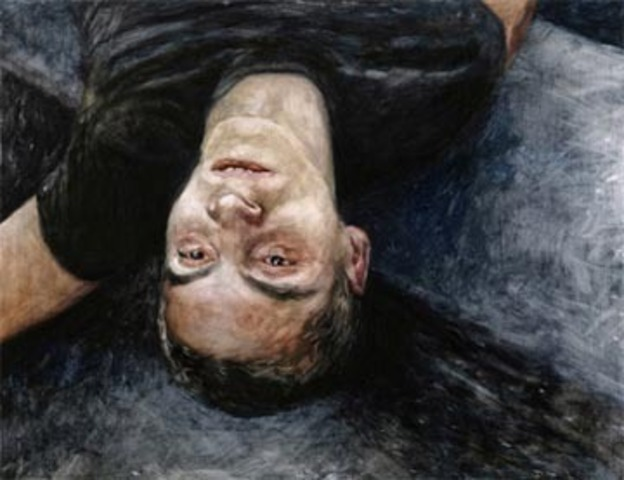 Ponyboy enrages Bob, who procedes to attempt to drown him in a nearby fountain, Johnny is scared, so his first instinct is to stab Bob with his knife, killing him. Johnny and Ponyboy go see Dally, who gives them a gun, $50, and new clothes. They stow away on a train to Windrixville, where they find an abandonned church to sleep in. Ponyboy wakes up the next morning and finds a note from Johnny. It says he went to the store and will return shortly. He does, bringing a pack of cards, baloney, cigarettes, hair bleach, and a copy of Gone With the Wind. Ponyboy cuts and bleaches his hair while Johnny cuts his. 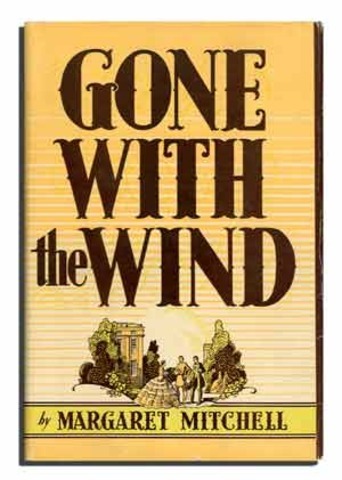 They spend the next few days passing the time reading Gone With the Wind and smoking. Ponyboy recites to Johnny the poem Nothing Gold Can Stay by Robert Frost. Later on, Dally shows up. Johnny tells Dally that he wants to go back to town and pay for his crimes. 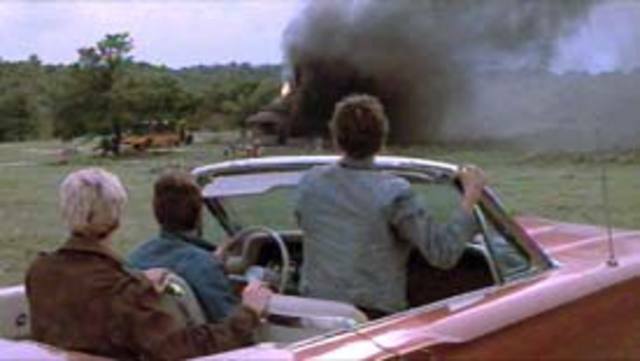 As he drives Ponyboy and Johnny back home, they see the church is on fire. They jump out of the car, and run up the hill to the church. They discover that there are children stuck in the church, so they go in to save them. Ponyboy had a few minor injuries, Dally was burned but will most likely be alright, but Johnny was hit by a piece of timber, and may have broken his back. They are rushed to the hospital. The news interviews the Curtis brothers. The next day, Ponyboy hangs out with Two-Bit while Sodapop and Darry are working. They go to get Ice Cream, they run onto Randy, who asks to talk with Ponyboy. He says that he is not going to fight. Ponyboy and Two-Bit go visit Johnny in the hospital. At first, the nurses wouldn't let them in, but then a doctor said "It won't hurt him at this point." Only Ponyboy catcches this, implying Johnny will die. After they talk for a while, the nurse forces them out, so they go visit Dally. Dally asks for Two-Bit's knife, saying he might be able to make it to the rumble if he uses it. Ponyboy later sees Cherry, who refuses to see Johnny. They talk about the sunset for a while. Ponyboy feels sick, so he takes a few aspirins. He asks the gang why they like fighting, and they say they like winning. They meet the Socs, who their leader seems to know Darry. The two gangs begin to fight, weapon-free. 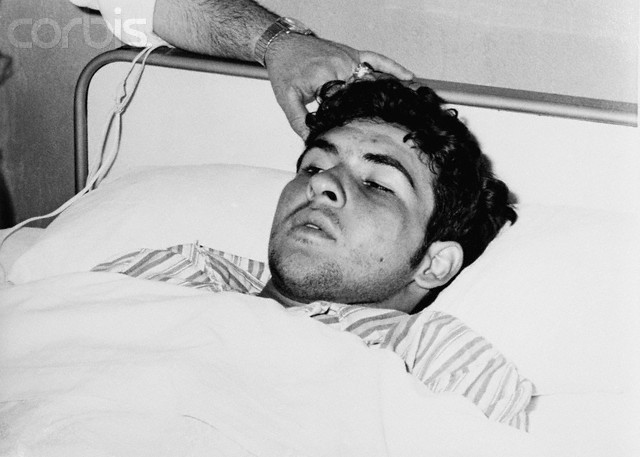 Dally shows up, using Two-Bit's knife to threaten the nurse. The Greasers win, but end up damaged. Ponyboy and Dally go visit Johnny, who tells Ponyboy to "stay gold", then dies. The chapter ends with Dally crying "Dammit, Johnny!' and runs off. Ponyboy is offered a ride home by a man in a car. When he gets home, he sees the Greasers, minus Dally, recovering. He tells them Johnny is dead. 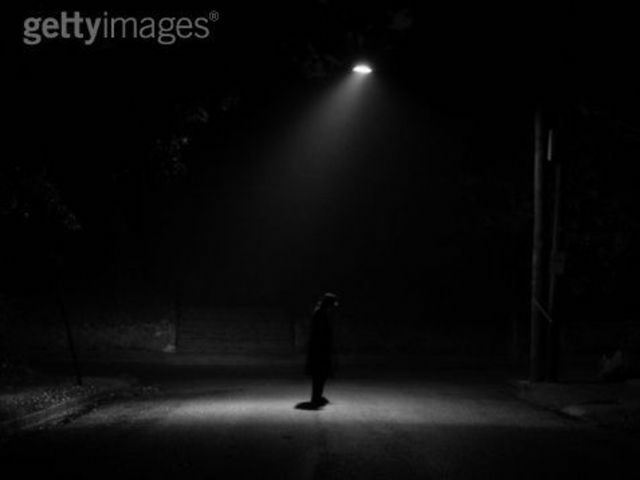 Darry picks up the phone, and he says it's Dally, who needs help hiding from the police. They all go after him, and they find Dally surrounded by the police. He pulls out an unloaded gun, and the police begin to shoot, killing him. Ponyboy passes out, only to wake up three days later. Ponyboy is restricted to bed for a week. Randy comes to visit him, Ponyboy begins to believe he killed Bob, not Johnny. Darry asks Randy to leave. At the hearing, the judge asks Ponyboy questions, then lets him return home with Sodapop and Darry. The next day, he goes to get lunch with Two-Bit and Steve, then they are ambushed by Socs. Ponyboy scares them off with a glass bottle, saying he's not scared anymore. Johnny's death causes his grades to slip, and the teacher says he'll let him pass with at least a C. He begins to write about his adventures.